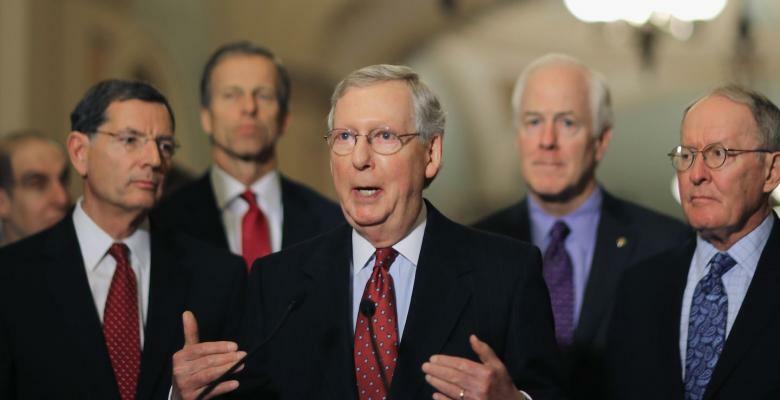 Last night’s report that Senate Majority Leader Mitch McConnell is pulling the plug on voting to implement the Better Care Reconciliation Act was no doubt welcome news to many Americans. And for good reason: some 22 million Americans would have lost health coverage under the GOP’s proposed bill, which has long been considered nothing more than flimsy cover under which McConnell and House Speaker Paul Ryan could pass their coveted tax cuts for the rich. As it stands right now, McConnell doesn’t have the votes for a straight repeal, either, as was the case back in January when the idea was initially floated. In fact, the reason Republicans pivoted to “repeal and replace” was because of the intense public outcry they faced over their original plan to repeal and delay. To be fair, Republicans did vote in 2015 to repeal Obamacare, so there is precedent; however, that vote was largely symbolic, since Obama was still in office and a veto was an absolute certainty. I’ll give Republicans this: they’ve mastered the art of appearing to take action without, you know, actually taking any. If it weren’t such a serious debate that could potentially affect millions of lives, the GOP’s flailing would be somewhat amusing. The Affordable Care Act was passed in 2010, and for the past 7 years, Republicans have done little else but stomp their feet and hold their breath, taking every opportunity to rail against the law. Their original argument was rooted in the certainty that Obamacare would “destroy the economy,” which is more than a little ironic given that, according to Trump, “the stock market has hit a new high [and] job numbers are the best they’ve been in 16 years.” Then it was a “government overreach” issue. And so on and so on. Get rid of Obamacare and figure it out later. To make matters worse, millions of conservative Americans who opposed Obamacare at its outset are now experiencing firsthand the benefits of expanded, affordable access to healthcare. And as much as many of them may hate President Obama, I’d hazard a guess that for the majority, their hatred of our former President doesn’t outweigh their desire to, you know, live. To be clear, this isn’t a liberal vs. conservative issue. But if you are conservative, you should be insulted by how little Republicans in Congress think of you. They lied to their constituents over and over again. First, they offered grave (and untrue) predictions that Obamacare would destroy the economy. Then, they (falsely) treated Obamacare as a harbinger of the destruction of individual freedom. And despite our collective better judgment, they were rewarded for it. But the lies haven’t stopped since Republicans have retaken the House and Senate; in fact, they’ve only gotten worse. They swore up and down that Obamacare was failing, even though it isn’t. They promised they’d get rid of Obamacare and give us our freedom back, conveniently ignoring the fact that “freedom” in this case means “freedom to not have health care.” They vowed to replace Obamacare with something that actually works while simultaneously scrambling behind closed doors to come up with something, anything that they could spin as a win for the American people, even as they knew it was anything but. Worst of all, they lied by promising better health care while offering no specifics on how they planned to achieve that goal, hoping to ram the bill through before anybody realized how atrocious it is. Once people felt the impact of how terrible their bill is, their plan was to lie — yet again — and claim that any negative outcomes were simply residual effects of that terrible Obamacare bill that they so bravely dismantled. And had they passed a simple repeal, I firmly believe their plan would have been to pretend they were working on an amazing replacement until just after the 2018 midterms, then let it drop and hope nobody noticed. Not only do they have no compunction about lying to voters, but they also seem to think voters are so stupid, so incurious and so consumed by partisan politics that they could actually get away with it. Here’s the thing: Obamacare is far from perfect. There are serious issues with parts of the legislation, and I completely agree that they need to be corrected. But Republicans in general and Mitch McConnell, in particular, have no desire to fix Obamacare for one simple reason: it’s Obamacare. McConnell and his ilk despise the fact that Obamacare passed over their objections, just as they despise the fact that it has been, by and large, a rousing success and a huge step towards universal health care (and by the way, the United States is the only developed country that doesn’t currently offer universal health care). Congressional Republicans have no plan to improve Obamacare, because to do so would mean further bolstering Obama’s legacy. In their enfeebled minds, addled as they are by partisan hackery, it would be hypocritical of them to come to the aid of a man they spent eight years painting as the figurehead of the fall of the American Empire. And that’s a goddamn shame. Obamacare has allowed over 25 million previously-uninsured Americans access to health care, and it has improved the lives of countless millions of others. In any other universe, the results would be self-evident: the Affordable Care Act is a good thing for the American people. But Mitch McConnell and the GOP don’t care about the American people ­— they’re craven idiots driven by party-over-country ideology and little else. So while it might feel good to celebrate today, never underestimate the GOP’s commitment to “winning,” no matter the damage to the constituents whose interests they were elected to represent. I have a feeling this debate isn’t going away anytime soon.